Mohammad Nejad, a Persian-born master multi-instrumentalist, was born to a musical family in Tehran, Iran. As a young child, Persian classical music was passed down to him from his father. In Tehran he attended a special high school for musicians, later graduating from Fine Arts Academy in 1976, and in 1990 received a Bachelors of Fine Arts Musicianship and Performance from Tehran University, proficient in both the Western and Persian musical systems. While studying toward the completion of his degree, he was blessed with having master teachers of Persian classical music including Ostad Roushanravan, Ostad Sinaki, Ostad Jankook, Ostad Paayvar, Ostad Tavakol, Ostad Tahmasebiyan, Ostad Moosavi, Ostad Khoshdel and Ostad Baharlou. In the early 1990s he began recording for the Iranian motion picture industry. He composed for and performed with many music and dance ensembles in Iran. Nejad came to the United States in 1995, he now resides in the San Francisco Bay Area. 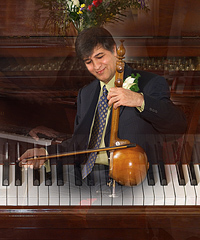 Nejad plays a large number of instruments, including ney, zurna, Western flute, santur, kanun, oud, setar, dotar, tar, kemanche, violin, daf, dumbek, zarb, accordion and keyboards. He effectively uses Persian instruments to add a Persian influence to Western classical, jazz, blues, new age, and flamenco. He also performs traditional Persian classical music. He collaborates with many other musicians and ensembles. He has performed throughout Asia, Europe, and the United States, including most campuses of the University of California, the Palace of Fine Arts and the Ethnic Dance Festival in San Francisco, and the San Jose Center for the Performing Arts. He teaches privately and through workshops. Here he established the Nejad World Music Center, to teach youth and adults in the community and bring world artists to the United States for collaboration and performance.